The purpose of the OSF HealthCare Foundation is to support the Mission of The Sisters' of the Third Order of St. Francis, "In the spirit of Christ and the example of Francis of Assisi, the Mission of OSF HealthCare is to serve persons with the greatest care and love in a community that celebrates the gift of Life." The OSF HealthCare Foundation (FEIN # 37-1259284) provides the 501(c)3 status that allows gifts to this Ministry to be tax deductible. 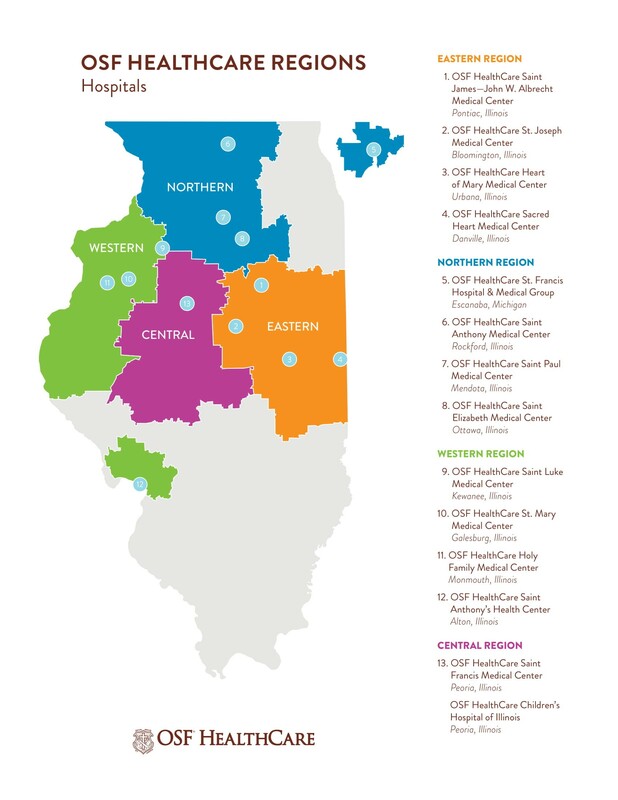 The Ministry of OSF HealthCare includes thirteen acute care facilities, including OSF HealthCare Children's Hospital of Illinois, one long-term care facility and two colleges of nursing located in Peoria and Rockford, Illinois. Each local Foundation office serves their community with the full resources of the OSF HealthCare Foundation behind them. All gifts to support your local medical center or hospital stay local. We are One OSF, committed to providing local service to our donors and desire to develop meaningful relationships to ensure donor intent and philanthropic goals are met fully according to their interest and passions. Whether your desire is to support the OSF programs closest to your home, or to support our OSF Ministry as a whole, we are here to help.